In an alternate universe, the NCAA tournament is decided trial-by-combat style, with each school's mascot serving as its champion. Until that becomes acceptable in this universe, though, we’ll just have to imagine. 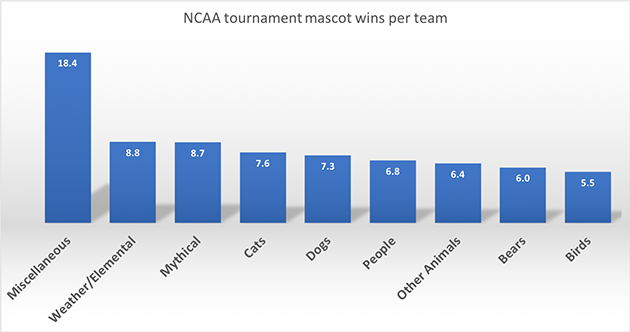 Or we could take a detailed statistical dive into the NCAA tournament success of each type of mascot and pretend like the fuzzy character cheering teams on from the sideline has a tangible impact on a team's performance in March Madness. Bears, Birds, Cats, Dogs, Miscellaneous, Mythical, Other Animals, People, Weather/Elemental. While most mascots easily fit into one of these categories, some were more complicated, so we looked up the history of the mascot’s origin in those cases. For example, while the North Carolina Tar Heels' on-court mascot is a ram, there are two stories for how the Tar Heels got their nickname and both are about humans. So the Tar Heels fall into our People category. People are the most common mascots. Of the 302 teams that have played in the NCAA tournament since 1985, 92 have had human mascots, from the North Carolina A&T Aggies to the Hawaii Warriors. 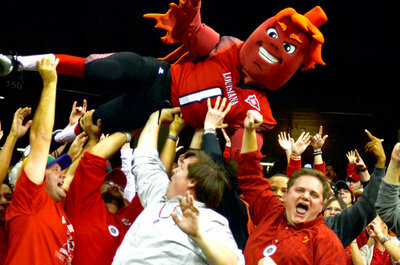 But the most common mascot name is a tie between Tigers (Jackson State, Tennessee State, Texas Southern, Towson, Pacific, Princeton, Clemson, Auburn, LSU, Missouri and Memphis) and Bulldogs (Drake, North Carolina-Asheville, Samford, South Carolina State, Fresno State, Yale, Louisiana Tech, Georgia, Mississippi State, Butler and Gonzaga). Tigers and Bulldogs have 11 teams repping them each. When it comes to winning games, Mythical and Miscellaneous teams come up clutch. The Mythical category includes the five-time national champion Duke Blue Devils (and the zero-time national champion Central Connecticut Blue Devils). 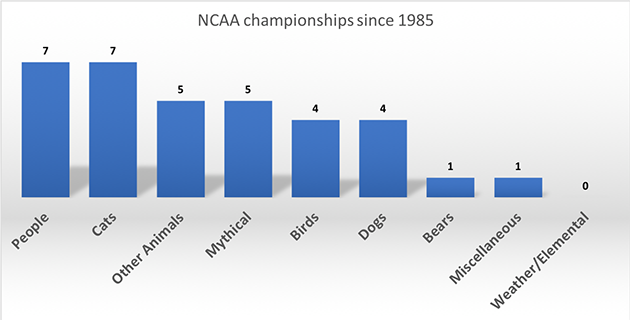 The 14 teams in that category have played 209 games and are 122-87 (58.4 percent) in the tournament since 1985, though that might be (see: definitely is) heavily skewed by Duke's NCAA-leading 94 NCAA tournament wins since 1985. No other Mythical team has even been to a Final Four since 1985, and the next-winningest team in the category would be the DePaul Blue Demons, who are 7-9 in March Madness play. Miscellaneous teams have a little more parity, with the Ohio State Buckeyes, Stanford Cardinal, Syracuse Orange, and Wichita State Shockers all having double-digit NCAA tournament wins. That category as a whole is 129-94 (57.8 percent) in the tournament. Miscellaneous teams get even more impressive when you look at how many wins each category has per team. That's because Miscellaneous includes only seven teams: the Louisiana-Lafayette Ragin' Cajuns (an actual pepper), the Harvard Crimson (a color), the Western Kentucky Hilltoppers (a ... something? 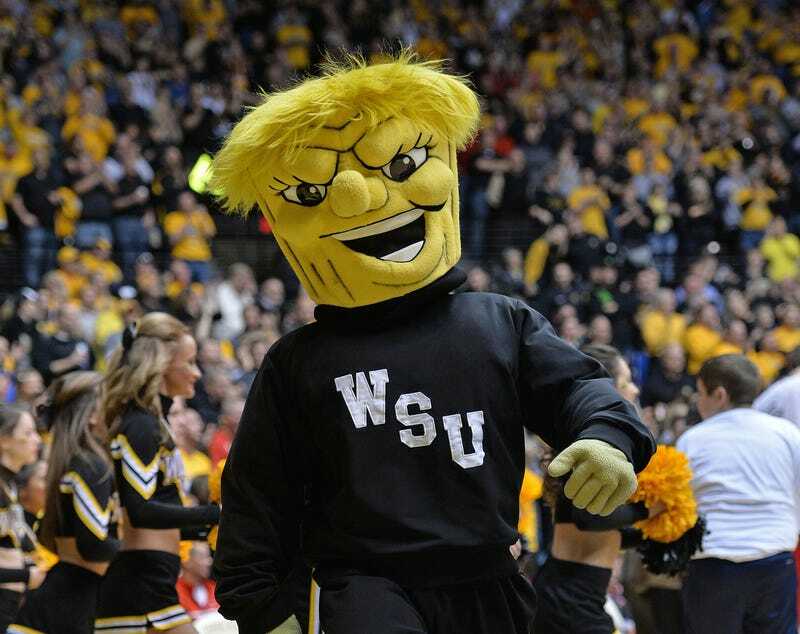 ), the Wichita State Shockers (an anthropomorphic bundle of wheat), the Stanford Cardinal (a tree straight from your nightmares), the Ohio State Buckeyes (a poisonous nut) and the Syracuse Orange (a happy piece of fruit). Combined, the seven Miscellaneous squads have 95 NCAA tournament appearances. They've been to 10 Final Fours (Syracuse five times, Ohio State thrice, Stanford and Wichita State once each), and won one title: Syracuse in 2003. The only category with a winning record against Miscellaneous is Weather/Elemental teams, which includes schools such as the Pepperdine Waves, the Tulane Green Wave, the Miami Hurricanes, the Tulsa Golden Hurricane and the Iowa State Cyclones. The most one-sided matchup is Mythical teams' 7-1 lead over Weather/Elemental teams, though demons' ability to control the weather and fire doesn't surprise us too much. 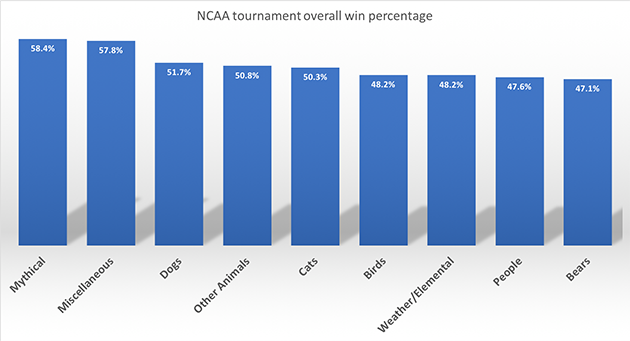 Dogs are 37-26 (58.7 percent) against Cats in the tournament, which settles that feud once and for all, right? Bird teams are 4-8 against Weather/Elemental teams. Cyclones have taken down Redbirds, Eagles, and RedHawks. Seafaring warriors, on the other hand, fare fairly well well against rough waves. Midshipmen, Pirates, and Spartans (they had boats, give us a break) have all survived Hurricanes and Cyclones. Finally, when it comes to the title game, it's good to be a Wildcat. Villanova (1985, 2016, 2018), Kentucky (1996, 1998, 2012), and Arizona (1997) are 7-3 in championship games since 1985. The next closest mascot is the Blue Devil, as Duke has five national titles to its name (1991, 1992, 2001, 2010, 2015) in nine trips to the championship. 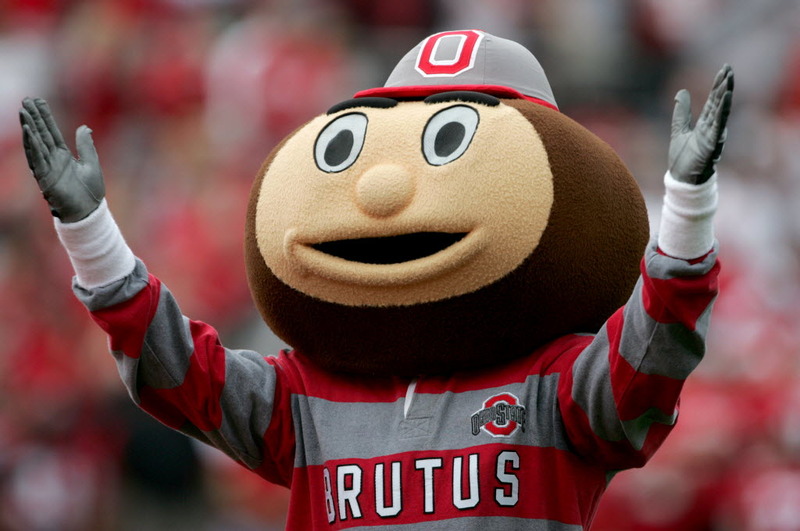 So what to take from this other than the realization that mascots have absolutely no impact on the NCAA tournament? If you want to pick your bracket in hopes that the mascots themselves will take the court ... well, you probably shouldn't be picking brackets. But if you insist, go with demons and anthropomorphic food.